These precision spray valves apply low to medium viscosity liquids without excessive mess or waste. Using low pressure and low volume, they can be adjusted from a jet to a fine mist. Used with the TS500R digital valve controller for fully automated or manual operator controlled applications. The TS5520 spray valve provides precise, consistent coating of low to medium viscosity fluids, including lubricants (oil and grease), activators and inks. Micro-litre to millilitre amounts can be reliably dispensed in round patterns with diameters ranging from 1/4 to 3.0 inches (6.35 to 76.2 mm). The combination of adjustable fluid flow, adjustable nozzle air and post-air cut-off provides excellent spray control. Precision-machined components with spring loaded Teflon packings ensure many millions of trouble-free cycles. 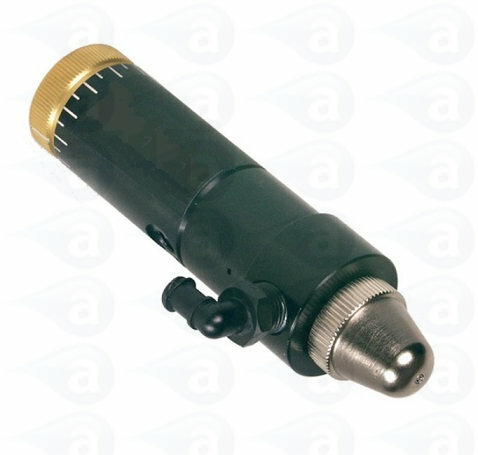 Compact spray valve with round spray pattern nozzle for controlled precision spraying, bonding, marking or lubricating. Spray Valves are designed for precise spray applications of low to medium viscosity materials. An external stroke control makes it easy to fine-tune fluid flow. Total control of the spray cycle is provided by adjustable fluid flow and precise control of pre-spray, atomizing air and post-spray with the TS500R controller. Normal maintenance is simple and downtime is virtually eliminated with only one seal to replace. 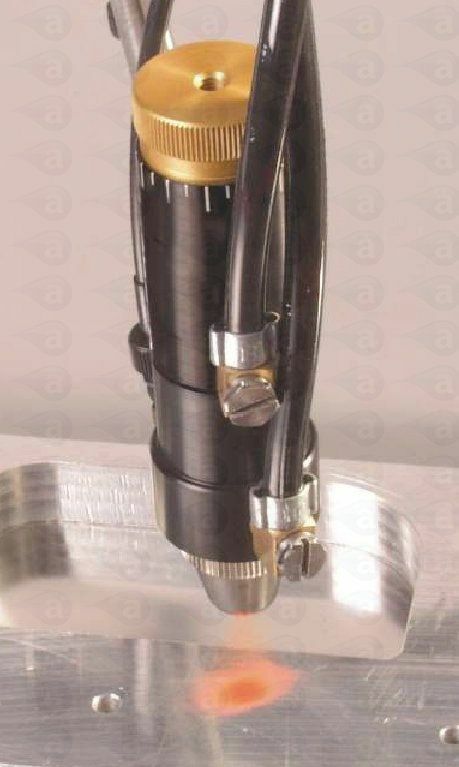 Operation - Input air pressure acts on the piston that retracts the stainless steel precision needle from the nozzle, allowing liquid to flow. Simultaneously, low volume low pressure air flows around the nozzle, dispersing the liquid into fine droplets. At the end of the cycle, the needle moves to stop the fluid flow, while air continues for a few milliseconds to ensure that the nozzle is cleaned of all fluids, providing positive spray cut-off. 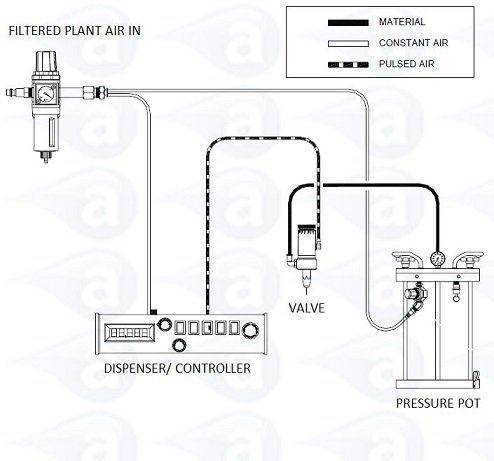 Pressure Pots compatible with this spray valve and controllers. Typical Applications:- Spray deposits of oils, inks, lubricants, conformal coatings, solvents, primers and more.